New Windows Rhvac Desktop Update adds Energy Star Reports! Elite Software offers over 30 programs for all kinds of mechanical, electrical, and plumbing design applications. This monthly email newsletter will announce new software, tradeshow events, and tips on using existing software in new ways to address various code related issues. A new Rhvac Desktop windows update available here has been released that provides an Energy Star report option. To be Energy Star rated, a home must meet the Energy Star guidelines, which require high performance insulation, windows, and HVAC equipment. Proof of tight construction and well sealed ducts is required as well. See more on the benefits of Energy Star here. See more on how Rhvac helps with Energy Star compliance below. In the August newsletter as seen here there was an in depth discussion of HVAC equipment expanded ratings data and sources for that data. More sources have been added, and some corrections to existing sources have been made, which can all be seen here. You can also check out new instructional videos for Rhvac Online Manual J and Manual D calculations here. To earn the Energy Star rating, a home must meet guidelines for energy efficiency set by the U.S. Environmental Protection Agency. These homes are at least 15% more energy efficient than homes built to the 2004 International Residential Code (IRC), and include additional energy-saving features that typically make them 20-30% more efficient than standard homes. Energy Star requirements are mostly uniform across the United States, although four states, Florida, Washington, Oregon, and California, have some special requirements. PDF's for your state's requirements can be downloaded from here. 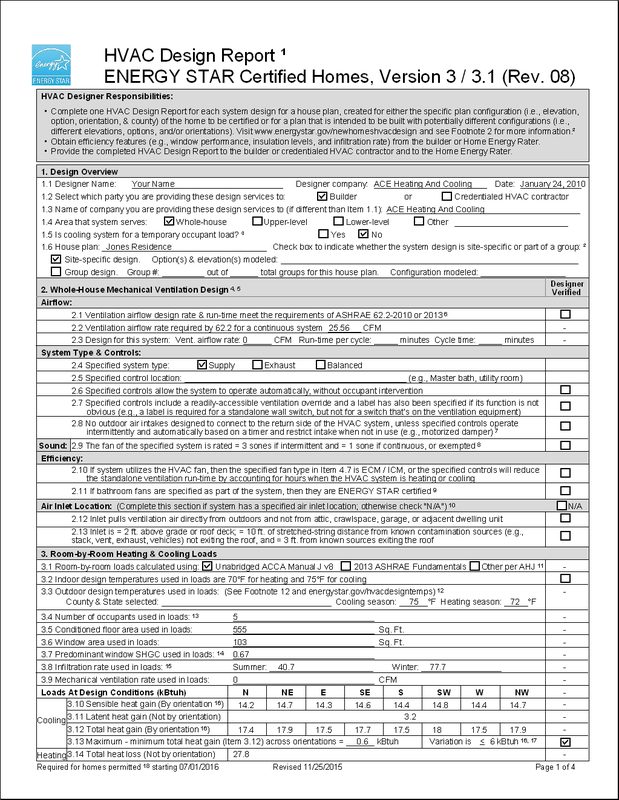 The HVAC Design Report forms for Energy Star are typically four pages as seen here. 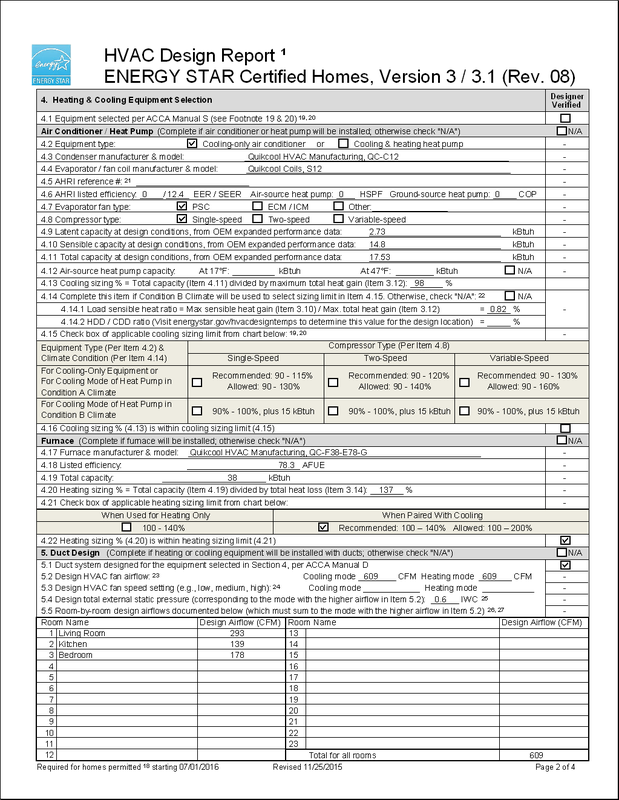 The first two pages of these forms have numerous "fill in the blank" type questions that fortunately match very well with the information entered into Rhvac Desktop project files. This allows Rhvac Desktop to create and fill out those critical two pages that would otherwise take a great deal of time to complete by hand. See below an example of the Energy Star HVAC Design Report as created by Rhvac Desktop for a sample project. Users of Rhvac Desktop version 9 can download this update for free here. Copyright @ 2018 Elite Software Development, Inc.